Devotion to the Holy Face was revealed by Jesus to Sr Marie of St Peter (1816-1848) a Carmelite nun of Tours in France. The primary purpose of the devotion is to make reparation for sins against the first three commandments: Denial of God (atheism / communism), Blasphemy, and the profanation of Sundays and Holy Days. 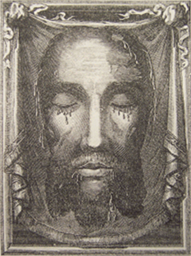 The devotion to the Holy Face of Jesus, based on the life and writings of Sr. Marie of St. Peter, was eventually approved by Pope Leo XIII in 1885 who established the devotion as an Arch-confraternity for the whole world. In January 1849 Pope Pius IX had the relic of Veronica's veil placed for public veneration in Rome. On the third day of the exposition the image on the veil, formerly so faint as to be barely visible, became transformed. The Divine Face appeared distinctly, as if living, and was illuminated by a soft light. Reproductions of the veil such as the one above were later printed, touched to the original and sent abroad for veneration. 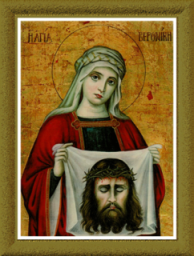 All those who honor my face in a spirit of reparation will by doing so perform the office of the pious Veronica. According to the care they take in making reparation to my Face, disfigured by blasphemers, so will I take care of their souls which have been disfigured by sin. My Face is the seal of the Divinity, which has the virtue of reproducing in souls the image of God. The prayers of reparation dictated to and composed by Sr. Mary of St. Peter are found below. It was revealed to her that this work against blasphemy (abusing the Holy Name of God) includes reparation for all attacks against religion and against Holy Church, since these also constitute a form of blasphemy.